Reaching Kasang Lansdowne is the nearest hill station from Delhi just 250 kms , 95 km from Haridwar and 150 km from Dehradun. Best way to reach Lansdowne is by road. The Road route from Delhi has been given below. If you opt for Rail Route, the nearest railhead for Lansdowne is Kotdwar, which is well connected by buses and jeeps. There is no dearth of private taxis to cover the 41-km distance between Kotdwar and Lansdowne. Kotdwar is a gateway to the hills and one of the last railway stations for Garhwal. Route From Delhi : You can choose the route as per your location in Delhi. Delhi...Modi Nagar....Meerut ...Mawana Road...Bhesuma... Mirapur....after Crossing Mirapur take a right for Bijnor ( after taking right on your left would be Monty Millions Restaurant )... ... Bijnor.......Nazibabad ....... Kotdwar....Dugadda......After 2.5 kms take a Right for Lansdowne another 15 km from there you will reach our resort Kasang Regency (is 6.5 kms short of Lansdowne on the main road itself on your right). 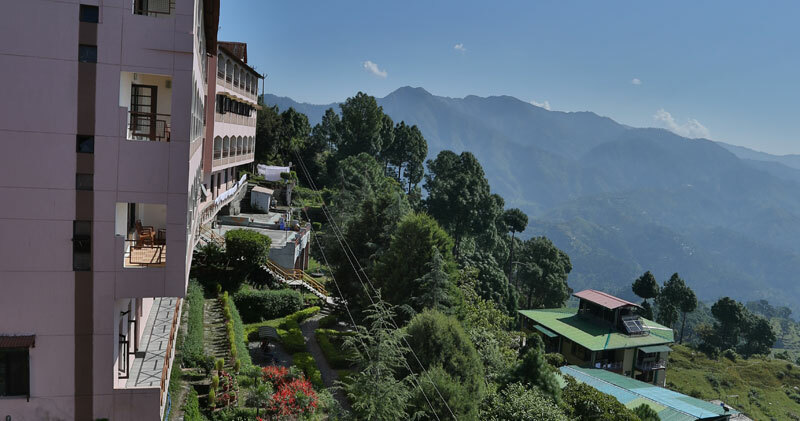 Lansdowne's Kasang Regency – a rare retreat for the seekers of peace, pristine beauty and pleasure in the Pauri-Garhwal region of Uttarakhand. Specialists in vegetarian, and equally adept in preparing non-vegetarian delights, that is the kind of chefs we have hired to serve you.